Despite its flaws, Babylon 5 remains one of TV’s greatest science fiction shows. It is ambitious storytelling, told on a scale rarely attempted in SF outside of literature (due to a lack of both money and imagination). But in addition to the grandeur, Babylon 5 succeeded in presenting something rare for an on-going series: a single narrative, something akin to a mini-series, but spread out over five years. Having a distinct beginning, middle, and end, made it difficult for new viewers to jump in at any time, but it gave the series more substance than the tidy, self-contained episodes that make up the bulk of TV dramas. In the universe of Babylon 5, actions had long term consequences and major changes were permanent (two things the makers of shows like Star Trek avoided –which is why that franchise is an insufferable string of cop-outs). Once Babylon 5 was brought to a close, creator J. M. Straczynski was left with a universe rich enough for more stories to take place. Enter Crusade, a spin-off that used Babylon 5‘s background but introduced a new set of characters. Unfortunately, Babylon 5‘s greatest strength — its extended narrative – was denied to Crusade. TNT cancelled the show before it even aired. The events in Crusade are a result of an interstellar war that climaxed during the fourth season of Babylon 5. The Shadows, the main antagonists of Babylon 5, have since left the galaxy, but their minions, the Drakh, have released a plague on Earth. Within five years, everyone on the planet will be dead. The starship Excalibur is given the task of finding a cure by following up any leads and traveling to any worlds that may contain clues to the plague’s origin. Crusade is preoccupied with death. The fate of ten billion people hangs over the crew of the Excalibur. But more than that, there are dead worlds to explore and dead civilizations to examine. 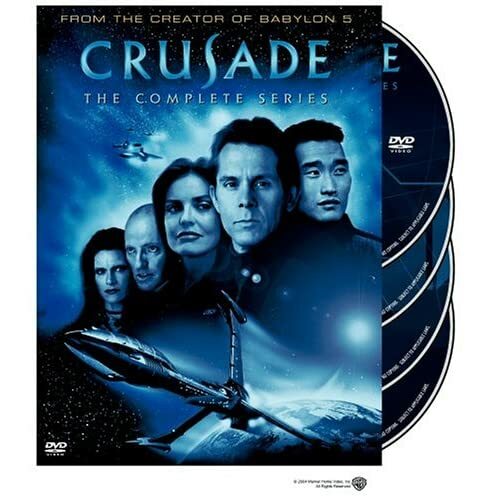 Although told on a smaller scale than Babylon 5, Crusade achieves its own sense of grandeur by its underlying melancholy; the universe is so old that entire civilizations have almost routinely risen and fallen, leaving behind empty cities to be picked over by other species with their own agendas and preoccupations. Crusade has some of the same problems as Babylon 5. Although well cast, there are moments when the performances are weak. The dialogue often contains hackneyed phrases. (Straczynski writes most of the teleplays himself. Such a demanding schedule may contribute to the predictable dialogue.) And scenes of humor and warmth sometimes feel forced. Straczynski appears more comfortable grappling with Big Ideas, discussing politics and war, honor and responsibility, than with the more personal moments. Crusade also has one problem that Babylon 5 didn’t. Like a lot of good SF, it contains analogies to contemporary issues such as strip mining, religious fanaticism, government censorship, and even the spread of disease among indigenous people. And while it avoids didacticism, sometimes offering no clear-cut solutions, too many episodes end with dialogue that seems to be aimed at the audience rather than at the other characters. Where Crusade is strongest is in its characters. Real and distinct, the crew of the Excalibur represent a mix of conflicting motives, painful pasts, and hidden agendas. Gideon (Gary Cole), the tough captain, was picked because he’d get the job done. But it isn’t long before his methods include using a potentially self-destructive instrument called the Apocalypse Box. Eilerson (David Allen Brooks), an archaeologist and translator, is painfully arrogant, but too brilliant to dismiss. His motives are more commercial than scientific. Lt. Matheson (Daniel Dae Kim), the second-in-command, is imbued with dignity and a real sense of loyalty. His own internal struggles include keeping his telepathic powers under wrap. Dureena (Carrie Dobro), a thief with, ironically, trust issues, had her species wiped out by the Drahk and is now out for revenge. Chambers (Marjean Holden), the doctor, is the one crew member who has family back on Earth, so for her, the quest for a cure is more personal. Galen (Peter Woodward), a Techno-Mage, is a mysterious character who comes and goes as he pleases. The show never got a chance to reveal the background of this original and intriguing character. Lochley (Tracy Scoggins), the only crossover from Babylon 5, was rarely in the show, but it was good the creators didn’t feel the need to contrive reasons for having every character in each episode. Crusade consists of only thirteen episodes. Since it resembles an unfinished novel, it’s not easy to recommend to a non-Babylon 5 fan. Nevertheless, Crusade was shaping up to be a quality show. The announcement by J. M. Straczynski that the quest for a cure would have taken a backseat to a new narrative direction in the second season makes the cancellation of the show that much more unfortunate.